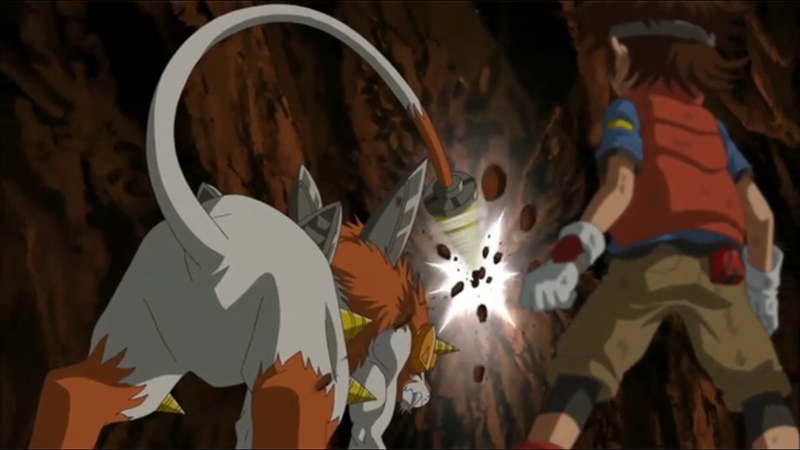 Digimon: System Restore: Fusion Episode 08: Meltdown in the Magma Zone! Give the episode this: it's not one where we're going to spend half of this space reminding the show how to spell “Agumon.” It's by far the best effort since we left Forest Zone. Mikey executes a plan that succeeds far better than it had any right to, Cutemon's story gets positive progression without resolution, the locals learn not to give up, and we finally start to learn what's going on with Dorulumon. We're also reminded that Reapmon's still around. The mere presence of Reapmon seems to make every scene better, and we don't even know anything about him! As encouraging as the episode is, it's all still very limited. Too many on the Fusion Fighters roster give off a great first impression, but haven't offered anything since. It's easy to get behind Mikey, Shoutmon, Ballistamon and even Jeremy and Angie to a degree. But since their debut, they haven't been all that interesting. Take Shoutmon for example. Our noble would-be king has been little more than a spazz, freaking out over everything. What kind of leader freaks out because Mikey's plan incorporates Ballistamon and not him? And Ballistamon's even worse, chipping in a snide comment here and there but not exhibiting any semblance of personality. 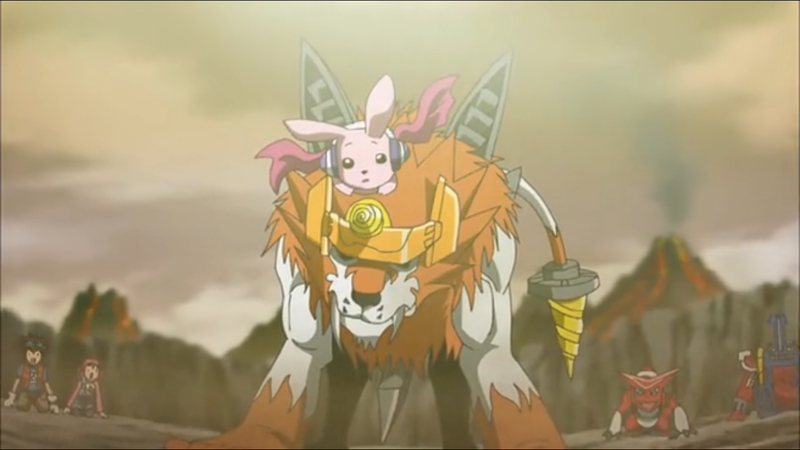 He's little more than an accessory to Shoutmon's fusions, and it's a bad sign that the second-in-command of the Fusion Fighters' Digimon roster has less charm and character than the likes of Armadillomon. At least Mikey redeems everything, right? That crafty, relentless spirit, always determined to save those in need. He's... doing the exact same shtick as he did back when we first met him. Yes, he pulls an impressive sleight of hand and digs his way out of the inescapable volcanic prison. Yes, he figures out how to beat AncientVolcanomon (apparently he's ancient now). Yes, he totally and inexcusably wastes the Augumon digicard (it would seem the cards were made in China), showing that he's not a flawless tactician. But it's all the same Mikey we've been seeing for several episodes now. There are no new facets of his character, and no character development to speak of. Is it fair to demand character development this early in the series? Probably not. At this point in previous seasons, everybody was still feeling their way through initial evolutions and confronting their first major obstacles. Absolutely nothing had happened in Data Squad by this point. Other than the occasional evolution being prompted by someone acknowledging a character flaw, it's too early for growth. Expecting something new out of Mikey is a direct result of the spotlight being entirely on him. In other series, the focus shifts from character to character. Sometimes it takes this long just for us to feel like we've met everybody. Not so here: Jeremy and Angie are doing their best to stay in the background, Nene's playing mysterious and Christopher's behavior is so disgusting that we don't want to know about him. Mikey carries the entire load, and has already had more episodes to himself than Yoshi got all season. Despite that, he doesn't use them. Dorulumon's been getting a steady dose of development as he slowly reveals layers of his personality. Despite his stubborn independent streak, he clearly does care about Cutemon, putting a sunny spin on the unlucky news about his parents. And he has to be at least a little sympathetic to Shoutmon's cause. It's ultimately Tactimon that accelerates the process, revealing that Dorulumon used to be on his team. While we have to wait for the exact details, this basic fact explains much of his character. It's a solid twist that will hopefully kickstart the plot. At the very least, we pray it will take the focus off of the Fusion Fighters for a while. The mechanics behind Ballistamon being able to create the false digivice is never really explained. Is he supposed to have the world's fastest 3D printer built into his compartment? If so, think he can make a better reproduction next time? Love that the Frigimon actually say “chillax” while calming down AncientVolcanomon. Keenan's mom is the coolest! You feel like Tactimon has his head together, but it's hard to get behind his demand to keep the prisoners alive until he can see Dorulumon. Originally, he was just going to have Mikey killed by the local guards, putting him far above every supervillain in history. Does Mikey really think he can make any progress digging solid earth with his bare hands? And how about Angie's reluctance to help, despite their dire situation? The one Prairiemon that actually gets lines is very hesitant and cowardly, but when he sees his fellow prisoners begin to come around to Mikey's plan, he's the first among them to pick up on this and lead the charge. That's more character development in one scene than Mikey's gotten in eight episodes. 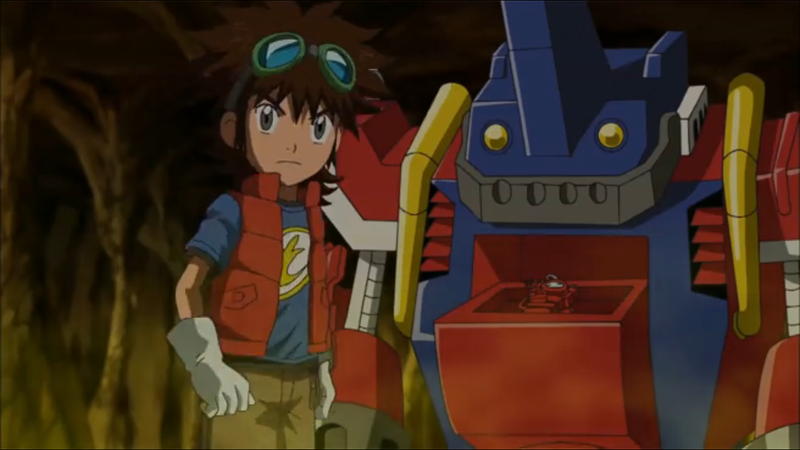 For those counting, the Starmon/Pickmon digifuse sequence happened three times in this episode. One was the sword, one for the axe, one as part of X4. Unacceptable. Did Jeremy say “bazinga” after AncientVolcanomon went down? I don't think it's fair to say that there was no character development in the first eight episodes of Data Squad. Most of those filler episodes did feature a minor, self-contained character arc that was ultimately meaningless once the season's main plot kicked in but still gave the illusion of character growth for the short term. The focus was almost exclusively on Marcus at this point (with Thomas and Yoshi getting maybe one spotlight episode each by episode 8), but it still wasn't quite so burdensome because his character did appear to have some amount of roundness to it. It was the same trick they used in the first two seasons and kinda-sorta used in Frontier, but on one character instead of 5-7. I think that they could have done the same thing with Mikey to keep Fusion interesting while still keeping him front and center. Of course, that wouldn't fix the tedium that comes from the Shoutmon X# series taking 90% of the battles in this chunk of the season, but that's another beast entirely. Another nice review. Though I'm surprised no mention of the appearance of Gotsumon and Pumpkinmon in a dungeon in the Digital World gets made.